This cottage garden favorite is reliable and hardy. Brilliant flower clusters on tall stems of scarlet-orange form over bright green foliage. This is an excellent cutting flower. 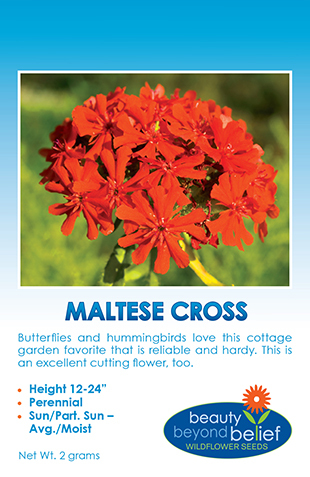 Maltese Cross is a cottage garden favorite that is reliable and hardy. Butterflies and hummingbirds love this plant. Brilliant flower clusters on tall stems of scarlet-orange on 2-4 ft. stems of bright green foliage. This is an excellent cutting flower. Flowers bloom from early to mid summer. Cutting back after flowering will encourage re-blooming. Sow 6-8 weeks before last frost and transplant outdoors after all danger of frost is past. Sow seeds into moist well-drained soil in sun or part shade. Seeds germinate best at 65-70 deg F in 14-24 days. Clumps may be divided in spring or fall.